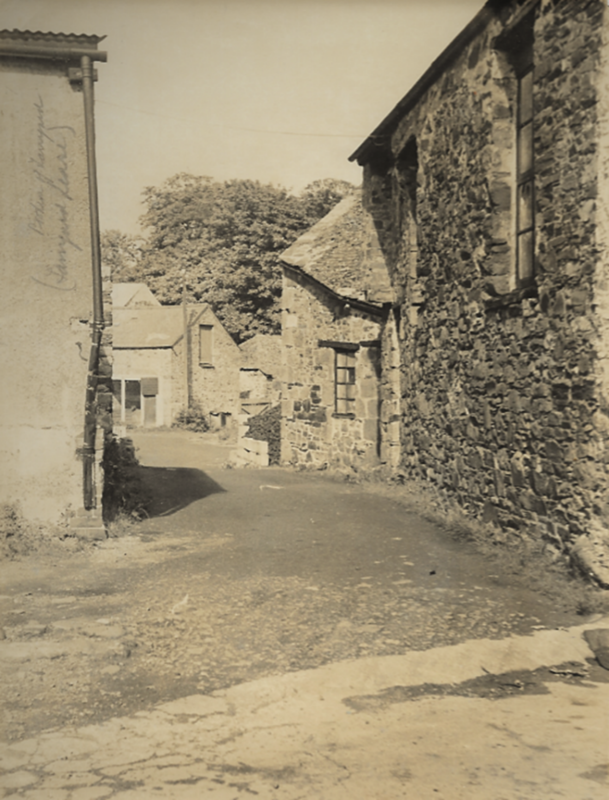 The existence of corn mills in Ivybridge can be traced back centuries but here we focus on what locals knew as Lee’s Mill, a flour and later provender mill, located just off Fore Street. 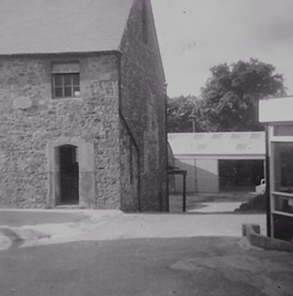 By the early nineteenth century the corn mill in the centre of Ivybridge had ceased to be owned by a miller and was leased to the Devonport Union Society, with the site becoming known as Union Mills. These societies arose from co-operative production schemes to provide flour more cheaply than a local miller. Each shareholder was permitted to take a weekly allowance of flour or bread relevant to their shareholding. Sharing the same site was Ivybridge Paper Mills, belonging to Francis and Henry Holman, However, unlike Stowford Paper Mills, this mill produced ‘thin browns’ and ‘sugar papers’. These wrapping papers would have been made from poor quality rags, old ropes, netting and canvas. By the beginning of the twentieth century this paper mill had closed. The Holman paper making business operating from their other mill located at Lee Mill, just a few miles away. What is a Provender Mill? A mill providing animal feed stuffs, often part of a flour mill. Stored cereal grains, predominantly wheat, but also barley, oats and maize are sorted to remove impurities prior to processing. Grains are then ground, micronized, flaked or rolled before blending to produce pellets or meal feed. The blended feed products are then stored in silos or similar bulk storage vessels awaiting despatch. In 1877 the Union Mills were rebuilt and carried an external plaque reading “Devonport Union Mill Ltd, Ellacott & Son, Engineers, Plymouth Foundry. Rebuilt 1877”. The following year the Exeter Flying Post carried an advertisement regarding the letting of the newly erected Flour Mill by tender. It was described as having “four pairs of stones with machinery complete” However, it is not known if any tenders were received. Following the closure of the paper mill Henry John Fice Lee purchased the site and converted the premises into a corn mill. He modernised the building suitable for milling and provided a new facade facing Fore Street. Mr Lee had moved from Yealmpton to Ivybridge as a baker and lived at Greenwood on Western Road. Apparently, he had told his wife he would one day own a mill to supply his bakery business. 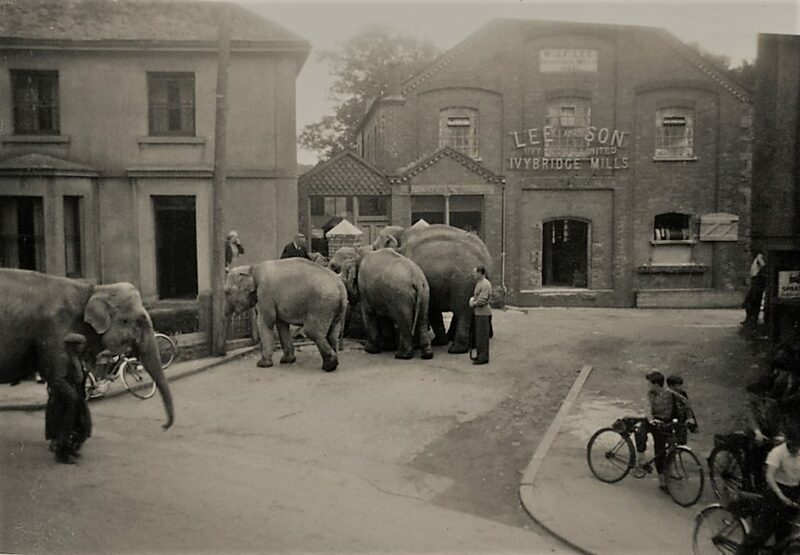 He later extended his operations at Yealmpton where he founded Lee Bros.
At this time, the neighbouring Union Mill in Fore Street was sold by the Devonport Union Society and came under the ownership of Mr Bertie Hawke. This marked the beginning of a period of intense rivalry between Mr Lee and Mr Hawke who were now in direct competition with one another. They were not only vying for business but also competing for the leat water which they both wanted for their individual machinery. Documentary evidence records that there were times when they did not speak and the question of whose turn it was to use water from the leat was conducted by correspondence between their respective solicitors. Eventually Mr Lee bought out Mr Hawke’s business and later still, purchased the tan-yard property. The complete site was then known as “Lee and Son, Ivybridge Ltd”. In the 1930s, the old Union Mills building became known as the “Cinema”. Twice a week a travelling cinema, operated by a couple from Saltash, would screen films for the local community. Seats cost between 4d., and 1s. 3d., (1.5p and 6p today) and the music was played by a retired school mistress called Queenie Peline. The young lads often brought their pea shooters with them, and using loose grain and maize which was always lying around on the floor of the mill, would shoot at people in the front rows. Eventually the manager would intervene, turn on the lights and eject the offenders! Henry John Fice Lee went on to be a prominent member of the community. In 1896 he was elected to the Urban Council and served for 27 years, the last ten as chairman. He was instrumental in progressing the water scheme in Ivybridge. For ten years he was, by virtue of his office on the Council, a justice of the peace, and in 1919 he was added to the Commission of the Peace for Devon. Additionally, he was a member of the Agricultural Millers’ Association in London; Chairman of the local Unemployment Committee, Chairman of the local Conservative and Unionist Association, and a founder member and President of the Ivybridge Bowling Club. He died on Sept 3 1931, eight weeks before his 70th Birthday. His memorial in Ivybridge is a plaque bearing his initials “H.J.F.L” set into the pavement outside Lloyds Bank in Fore Street. An unusual sight for the centre of Ivybridge ! 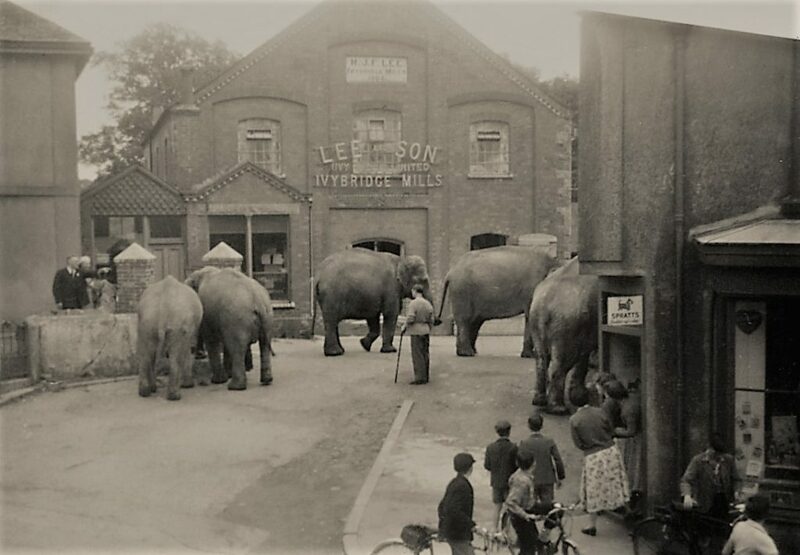 These photographs from the 1950s show elephants from the travelling circus taking a drink of water from the leat serving Lee’s Mill. After the death of Henry John Fice Lee the business became a private company, until his widow, around 1954, sold the business to a Mr Bradshaw. This gentleman then sold the business to British Oil and Cake Mills (BOCM) in October 1964. During the 1960s, power for the machinery was still supplied in the main by a water turbine, with the leat remaining the water source. The machinery included a corn crusher, a maize cutter, a one-ton mixer, and a chain hoist. 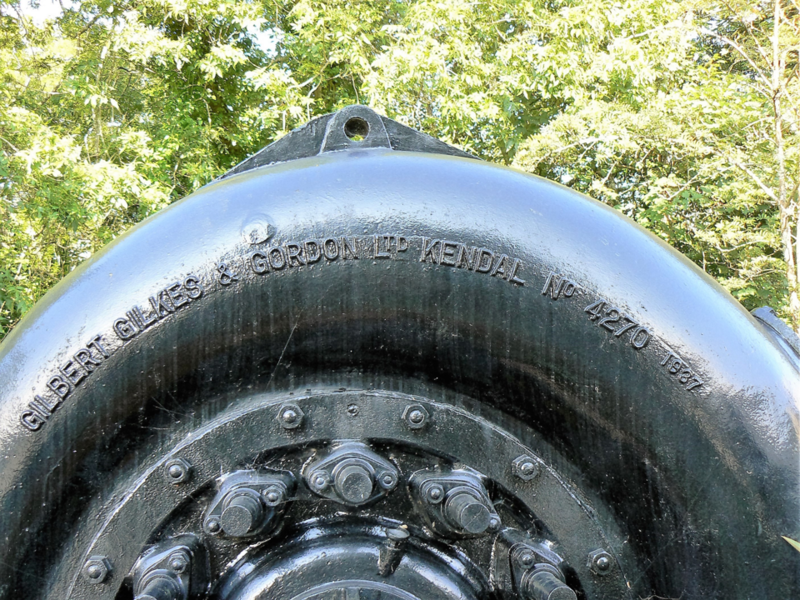 Way back in 1937 a water turbine manufactured by Gilkes and Gordon Ltd of Kendall was installed at Lee’s Mill. This Pelton Wheel turbine was apparently capable of supplying 30hp and it is believed the power was transmitted to the milling and mixing machinery by a series of underfloor belts and pulleys. 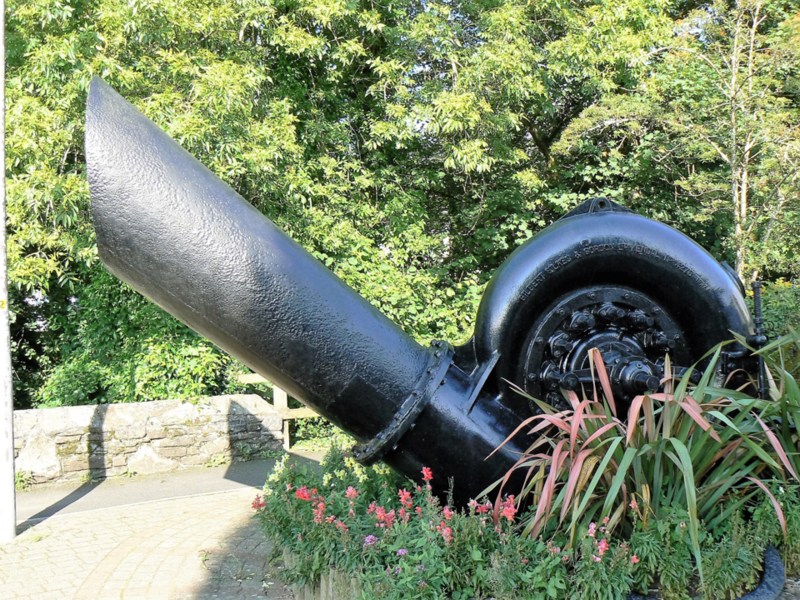 This turbine was saved when the site was eventually re-developed and is on permanent display at Harford Road Car Park. Its nickname was “The Snail” for obvious reasons. In 1899 British Oil and Cake Mills Limited (BOCM) was incorporated and became a pioneer in the manufacturing of animal feedstuffs on an industrial scale. The advances in both human and animal nutrition identified the virtues of a balanced diet and the contribution that the processing of certain raw materials could contribute to this. The Pelton wheel water turbine was invented by Lester Allan Pelton in the 1870s. This type of turbine extracts energy from the impulse of moving water, as opposed to the traditional overshot water wheels which relied upon the weight of the water to provide momentum. Nozzles direct forceful, high-speed streams of water against a rotary series of spoon-shaped buckets, also known as impulse blades, which are mounted around the circumferential rim of a drive wheel. Barley – the main cereal constituent in all animal feeding stuffs. Maize – ground to make maize-meal, and then included in the mixtures. Maize is also used whole or kibbled (cut) for poultry grain mixtures. Oats – chiefly crushed and sold for horses. Wheat – a little of this is ground for mixtures, but chiefly used for poultry grain mixture. Wheatfeed – a residue of the wheat grain after the flour has been removed. It is used a great deal in animal feeding stuffs as its lightness reduces the heaviness of a mixture. Grass-meal – dried grass, ground to a fine meal – normally fed to indoor poultry to enhance yolk colour in eggs. German-maize-meal – maize from North and South America sent to Germany where it is ground and then imported to England. Bran – the name given to the outer skin of the wheat berry taken off in the making of flour, mainly used in poultry and pig rations. Bran is also used for poultices and bran mashes for horses. In 1978 the entire site was sold to South Hams District Council for re-development. 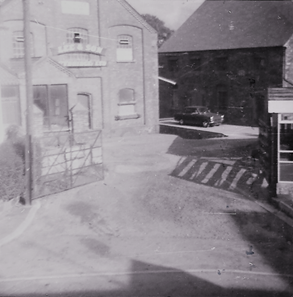 The entrance to Lee & Son in 1968. A very special thank you to Jacqui Leigh who kindly donated numerous historical documents regarding Lee’s Mill to our archive collection. Her meticulous accounts, compiled with the assistance of her father, were invaluable in providing historical facts and an insight to daily life at the provender mill. Her father, Frank Gowman, was Manager of the mill for 10 years when it was owned by B.O.C.M. 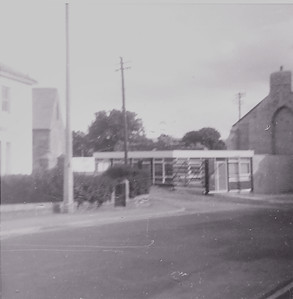 in the mid 1960s. Sharing the same site was Ivybridge Paper Mills, belonging to Francis and Henry Holman, However, unlike Stowford Paper Mills, this mill produced ‘thin browns’ and ‘sugar papers’. These wrapping papers would have been made from poor quality rags, old ropes, netting and canvas. By the beginning of the twentieth century this paper mill had closed with the Holman’s concentrating their paper manufacturing business at their other mill located at Lee Mill, just a few miles away. In the 1930s, the old Union Mills building, became known as the “Cinema”. Twice a week a travelling cinema, operated by a couple from Saltash, would screen films for the local community. Seats cost between 4d., and 1s. 3d., (1.5p and 6p today) and the music was played by a retired school mistress called Queenie Peline. The young lads often brought their pea shooters with them, and using loose grain and maize which was always lying around on the floor of the mill, would shoot at people in the front rows. Eventually the manager would intervene, turn on the lights and eject the offenders! After the death of Henry John Fice Lee the business became a private company until his widow, around 1954, sold the business to a Mr Bradshaw. This gentleman then sold the business to British Oil and Cake Mills (BOCM) in October 1964.